That's next week's drinking game sorted. "@beckdilley: Next week I'm gonna count how many times Jessie J says 'like' #TheVoiceUK"
Anyone else playing the drinking game where you drink every time @iamwill says "dope" on #thevoiceuk tonight? It's frustrating that they only recently identified the breach (I suspect the compromise occurred when STO launched, at the end of January 2010, with password cracking identifying most credentials almost immediately and stronger passwords taking until February 2010). It's good advice to change passwords if you've used the same one on other services, but I can't help think that over two years later the damage has probably already been done. I suspect a large number of compromised users also played World of Warcraft, and if they used the same credentials then they may have already seen their WoW accounts compromised, with miscreants stealing their gold (virtual currency) and expensive items. 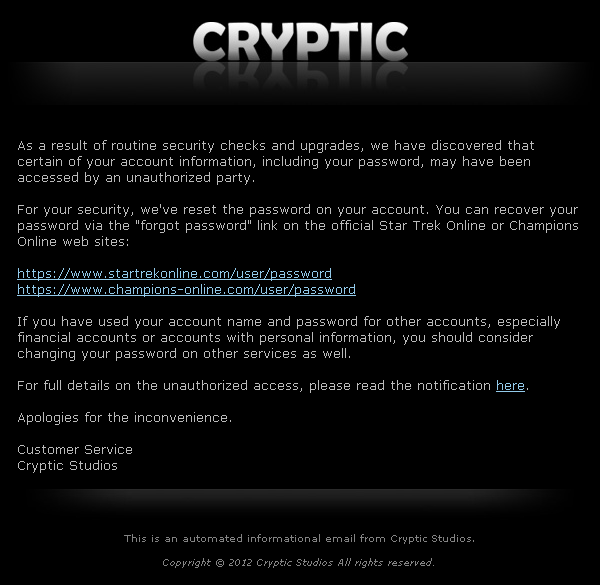 I gave up on Star Trek Online pretty early for a number of reasons (in general, it seemed pretty crap), I just wish I'd waited until it was free (at least I wasn't foolish enough to pay for a lifetime subscription) and until after the security issue had been fixed. What are the odds that it was a SQL injection issue? I'm assuming that the statement "it is apparent that the intruder has been able to crack some portion of the passwords in this database" means that they didn't salt their password hashes (or the salt was easy to identify - perhaps the attacker registered their own account with a weak password - and the cracked passwords were also trivial). There are several things I like about Easter. The main one, obviously, is the chocolate. A very close second is the long weekend. Another regular event over Easter is a LAN party held by some friends from university (although it's been a long time since we were at uni!). Unfortunately I couldn't attend it in person this year, but many of the games played at the LAN party are hosted on servers that anyone can join. I hadn't really played Left 4 Dead 2 or Team Fortress 2 since last summer, but I'd like to think I did pretty well. This was also a good test of the new network connection. I'd previously been using a couple of Netgear Powerline AV adapters to bridge upstairs and downstairs, but the connection wasn't great (blue light would constantly flicker, suggesting an intermittent connection). It was fine for browsing the internet, and games didn't appear to suffer, but streaming things off the fileserver was a bit painful and very slow. Instead of running a gigabit cable and drilling some holes (which would be my preferred choice, but is a lot more effort), I created a wireless bridge instead. I bought a couple of cheap 802.11n wireless access points and configured one as an access point and one to connect to it as a client. This seems to have worked surprisingly well, I'm easily getting 10MB/s between floors. I'm also running this bridge over another 2.4GHz channel, so my original/main 802.11g connection isn't affected and the 5GHz 802.11n connection is also impressively quick (no one else nearby is running 5GHz). This new setup seems to work pretty well (although not flawlessly, I have had to reboot the client a few times when the connection seemed to have slowed down). It'll do until I run a gigabit cable across the width of the house and down a floor (seems unlikely for now). Nice. Windows 8 hard disk moved between two old Dell laptops. Press F8. Install updates (including Intel graphics driver). Restart. Done. Charlotte? Again? Is that thing rigged? Any chance they can rig the Lotto machine with my numbers? Come on Rare Bob! You never know, you could win the Grand National.